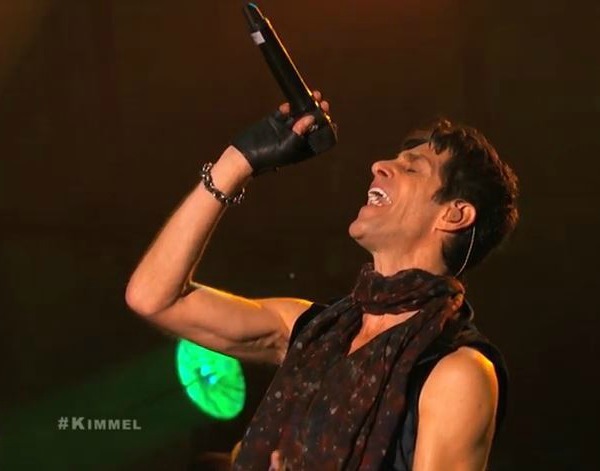 Last week Jane’s Addiction received a star on the Hollywood Walk of Fame, and to help celebrate the 25th anniversary of debut studio album Nothing’s Shocking, the band played a short set for “Jimmy Kimmel Live!,” part of which was aired on last night’s show and posted on the program’s YouTube channel. Below, you can watch the band rip up Ritual de lo Habitual classics “Stop!” and “Three Days,” plus “Another Soulmate,” its recently released single. let me get this straight.. to celebrate the 25th anniversary of Nothing’s Shocking, they played 2 songs from Ritual and one new song? does that make any sense at all? The artist formerly known as Perry. I think he shares the same stylist as, well…Prince. Neck up only- look at him and tell me I’m off. Awful… Jane’s is completely devoid of any of the chemistry and danger that once made them the greatest band in the world. They need to hang it up. What was that? Ugh! I have to agree with the other posts here, very dissapointing.